These are the most frequently asked question regarding the programme. 3) What are the qualification requirements? Following, you find the specific requirements for the G-TIME programme: Pre-qualification: A Bachelor's or equivalent degree from a recognized university in engineering, science and technology, business engineering, business administration (including business informatics, business mathematics and business geography) or economics, as well as a good previous academic performance are required for admission. • a valid IELTS-Academic score report. The minimum overall IELTS score for admission to TUHH is 6.5. A formal proof of proficiency in German is not required for admission to this program, but a basic knowledge of German will be helpful for everyday life during the first year in Hamburg. Regarding the study visit at the second-year partner institutions no country specific language skills are required. 4) What is the deadline for application? The application deadline for winter semester 2019/20 is 1st March 2019. 5) How does the tuition fees structure work? → The programme is subject to charges (tuition fees). The individual total amount of tuition fees depends on the choice of the second year partner. The following table provides an overview on the current tuition fees. 1) What is the selection criteria for assessing the application? First of all, you have to meet the admission requirements which you find on this website to be able to study GTIME. In the next steps, we will look at your grades and qualifications, but also consider extracurricular activities like internships and professional experience. 2) Are there any language prerequisites other than english for the programme? No, the medium of instruction is English for both of the years. However, knowing the local language will enhance your cultural experience. 3) What is the previous study background expected for enrolling to GTIME? We invite students from various backgrounds to study GTIME as the broad field of knowledge and interests is also a key strength when managing innovation. Yet, your previous degree should lie in the area of engineering, technology or economics. You find more details under admission requirements. 4) What are the follow up procedures after receiving acceptance to the course? If you are granted permission to study GTIME, the next step is to enroll in our programme. You do this by accepting our offer and by paying the required tuition fee. 5) Is the programme also open for the summer semester intake? No. The character of the degree with its second part taking place at one of our partner universities does not allow us to have a summer intake. 1) What are the standard academic year dates of each partner university? 2) Are there any guidelines I can use to decide the partner university? Your decision should be mainly based on your interests and what you would like to achieve during the two-year degree. Our websites holds plenty of information on what the partner universities offer, yet you will still have time to decide on your second year choice as you only need to make a decision after you finished the first semester. The type of degree you receive depends on the partner university you choose. 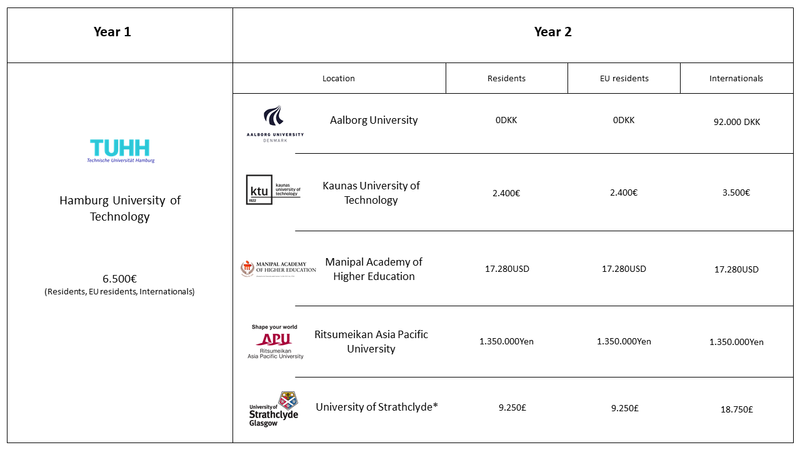 The Manipal Academy of Higher Education and the University of Strathclyde provide you with a Joint Degree, Kaunas University of Technology awards a Double Degree and choosing Aalborg University or Ritsumeikan Asia Pacific University will count as an exchange and give you a certificate of participation. 1) Is it possible to take classes outside my programme within the university? Yes, you are free to take extra subjects you are interested in, but you are not able to use these classes to collect ECTS points or grades for you degree. 2) What is the passing criteria for the programme? To receive a degree, you need to pass all exams in both locations. The requirements for passing depend on the universities at these locations. At e.g. TUHH this means to achieve at least 50% of all points in each exam. 3) What are the average class sizes?